Many of us have already witnessed the way yoga has benefited many adults because of the positive things that it can do to the body and mind. So why not introduce the age-old exercise to your kids and share with them the advantages of yoga in a fun and nurturing way? Your child can benefit greatly from yoga as it can sharpen the child’s ability to focus, concentrate, be self-confident and develop self-discipline. Children who diligently practice yoga will become aware of themselves from the inside out and this will eventually lead to positive developments in the child’s overall well-being. There are many ways that you can make yoga a part of you and your child’s life. Schedule a special time within the day, or if it’s not possible because of your schedule, week where you and your child can practice yoga together. You can either make time in the morning or in the afternoon after your child’s class. By doing this you are letting your child know that yoga is a family activity in which you bond and build more love. 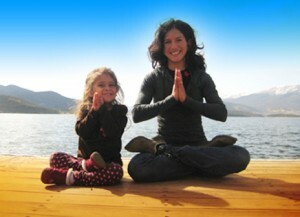 Create a space where you can do yoga with your child. Decorate it with special things that mean a lot to your child like photos and objects so he or she can relate to the space and won’t feel alienated. You can also help your child get excited about practicing yoga and help him or her identify with the their yoga practice by getting them their own yoga mat to practice on. Make sure to keep yoga sessions with your children fun rather than trying to push them try lavishing them with praise, love and lots of positive reinforcement whenever the practice yoga. This point is very important, associating only positive emotions to yoga very quickly your child will want to practice on there own simply because of the way it makes them feel. You can practice 10-15 minutes and increase the time in accordance to your progress. There are a lot of instructions on how to facilitate yoga with children because, as we know, the adult level will be too much for a child. With diligence and continued practice, you and your child will not only attain a better well-being but will also be bonded by the meditative activity of yoga.